I love this series. It’s up there with Harry Potter as one of my all-time favorite series. I know, that’s big praise, but I have loved every single book in this series so far. Every book has got me crying, yelling, laughing and swooning with the characters and the 5th installment in this series is no different. Is it perfect? No, it’s not. I can completely adore this series and still be aware of some of the flaws. However, I give priority to how much emotions a book makes me feel and how deeply enthralled I get by the world and the characters. And this book was just EPIC and AMAZING all over again! From the very first chapter, which is an Elena and Gavin flashback, it becomes very clear that the scope of this story will become so much bigger in this book. We go back and explore the foundations that were already put in place in the previous books and we get to discover what exactly is this ‘unfinished game’ that all the players are lining up for. Empire of Storms is the book that takes all the storylines from previous books and brings them together into one cohesive, epic story. We are seriously getting ready for the final chapter and I loved finding out how everything tied together, even if I am now entirely convinced the final book will break my heart completely. The story once again moves at breakneck speed. Though I predicted some small and obvious plot points, most of the story did not go AT ALL how I expected it to. From page one we are hurtled into the story and it is one big adventure until the very end. We have political intrigue, cities falling, scheming, fighting, sea battles, surprising revelations, familial drama, epic quests, ghosts and gods and monsters and romance. All the way until the ending, which was a whole new level of heartbreaking. Seriously, the ending is killer and I do not know how I will survive until next year without any answers. It’s number one for most heartbreaking ending I’ve read this year. One of the things I love about this series is the sheer amount of characters. And the surprising thing is, I love each and every one of them. Aelin is of course still our main character, and I still love her dearly. She has grown and matured a lot, even if she still has her flaws. She still keeps secrets and likes to get things done herself. She’s not so good at delegating, that’s for sure. But her heart, full of wildfire, is in the right place and there is nothing she wouldn’t do or give for her court, her country, her world. Talking about her court, can I just say they are absolute squad goals? We have our fierce fae warrior prince Rowan, loyal cousin Aedion and sassy shapeshifter Lysandra. And I love them all, just as I love that they are all becoming such an integral part of the story. This is as much their story as it is Aelin’s. However, there are two people who I have loved for a long time already, but this book has turned that love into complete adoration, and that’s Manon and Dorian. Now Aelin’s cool and all, but Manon is my queen, as much as Dorian is my king. I just love our evil witch that’s actually not at all evil and has a pretty big heart. She has some pretty big character development and revelations going on in this book, which only made me love her more. Then there’s Dorian, who has owned my heart since book one. I love him here even more, because it’s obvious that what happened to him in the previous books has changed him. He’s still Dorian, but he’s also still not over everything. He’s more quiet, more contemplative and maybe even a little sharper and naughty. So Dorian/Manon? I ship it. Hell, I don’t think I’ve ever shipped anything more. Some ancient, predatory part of her awoke at the half smile. It sat up, cocking its ears towards him. Not a whiff of fear. Interesting. Of course, there’s still more characters. We get to spend a lot of time with both Elide and Lorcan, both of whom I did not like in Queen of Shadows but have really grown on me here. And we also get to spend some time with another part of Rowan’s old cadre: Gavriel and Fenrys. The new guys on the block were really intriguing and I can’t wait to learn more about them in the next book. There was also a big hole in the group, as Chaol and Nesryn were still in the Southern Continent and didn’t make an appearance. Now, Chaol is one of my favorite characters (after Dorian and Manon) so I did really miss him, but I completely understand the decision not to add his POV to the mix in this book. It would just not have fitted in with what was going on with the rest of the group and would have taken away from the story. I still hope to see him return in the next book though. Plus we have a novella from his POV to look forward to as well, so I’m good! I guess it should be noted that while this series is considered young adult overall, this book does contain mature content. Yes, there are steamy scenes. And they are good. They are not super necessary to the story or don’t add anything, but I didn’t mind them. If you don’t like them, you can easily skip them and not miss anything. If you do like them, go ahead and enjoy! In general, I was a bit torn about the romance parts. I’m a big romantic and a major shipper. But when every single person in the story gets paired off, my realism radar starts beeping. This is not how it works, not everybody finds love. At least not at the same time. However, this is nitpicking, because on the other hand I’m happy I have some more shipping to do. And I ship it all. Every single ship. I can’t stop myself. So hey, I’ll live with my split opinions here. Also, I did kinda feel some ACOMAF parallels. I LOVED ACOMAF though, so again nitpicking here. 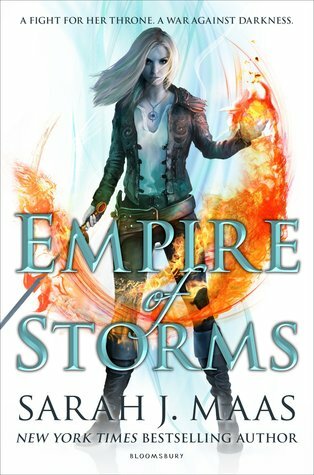 Overall, I loved Empire of Storms and thought it was another perfect installment in the series. I recommend this series to anyone who loves a good fantasy with intriguing and flawed characters, major squad goals, high sass levels, amazing worldbuilding, delicious romance, epic quests and mysteries spanning the entire series. “He knew her face before he remembered her name. Knew the white hair, like moonlight on water, that spilled over her dark, scalelike armor; knew the burnt-gold eyes. Knew that impossibly beautiful face, full of cold bloodlust and wicked cunning. Have you read empire of storms? What did you think about it?